As I recently wrote about in a Discovery Educator Network blog post, financial literacy is one of the important literacies for our students to acquire. Financial literacy, sometimes referred to as economic literacy, according to Atomic Learning, “targets the importance of making appropriate economic choices on a personal level, and understanding the connection personal, business, and governmental decisions have on individuals, society, and the economy”. Students are often taught, in a social studies class or a economics class, about the impact the decisions made by businesses and government have (and have had) on society and the economic climate. Students study capitalism, the Great Depression, government bail-outs of corporations, manufacturing, and so on. The contest involves students, over a period of two months, immersing themselves "into the financial life of a recent college graduate who has been working for about six months. Each student gets a regular paycheck, a checking account, a 401(k) savings account and bills to pay throughout the simulation. By maximizing 401(k) savings, paying bills on time and responding correctly to quiz questions while avoiding fees like late fees, overdraft fees and finance charges, students increase their individual score." There are six different start dates to pick from. (The first one is October 3, and registration for your class is due at least a week before the start dates.) At the mid-point and conclusion of each period, the highest scoring classroom will win a Classroom Grant with up to $5000. And, at the end of each two-month period, twenty-two students will be awarded a $20,000 scholarship each! The grand prize of a $100,000 scholarship will go to the student who had the highest score of any student during the contest period. What better way to give students real-world practice as they learn how to manage their money and finances? The added bonus of classroom grants and college scholarships will keep students engaged in the process. And, if they win, they will be well-versed in how to manage their winnings! So get your students involved today! 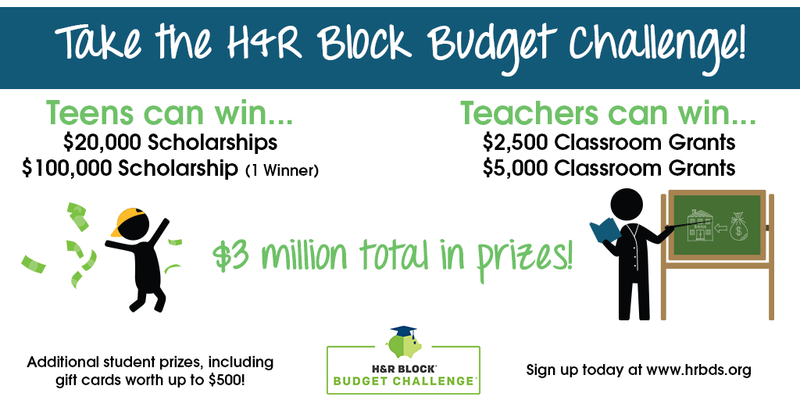 The H&R Block Budget Challenge site has much more information and details!